Return to Advice to Grow By! From a majestic oak, giant sequoias or a swaying palm there is nothing quite as beautiful in this world than a tree. They can provide us with shade, fruit, flowers and most importantly are the “lungs of planet”. While we have enjoyed some wet weather over the last week, California is still suffering from extreme drought conditions. Many residents have been encouraged to reduce water use by turning off their outdoor watering systems, but this may be causing stress to established trees that are becoming increasingly thirsty for water. In most traditional residential landscapes trees are surrounded by turfgrass. Turfgrass surrounded trees take advantage of the frequent and shallow watering schedule, typically set to help the lawn flourish. When residents eliminate or reduce water for lawns, trees cannot easily adapt to the new water shortage. “Mature fruit trees and landscape trees are worth saving! Recognizing early signs of drought stress is important because irreversible damage can occur that no amount of watering will correct.” said Janet Hartin, UC Cooperative Extension advisor in a recent article, Save Water, But Also Save Trees During a Drought. Replacing small plants, lawns and shrubs is easy compared to a large tree which takes years to become established. 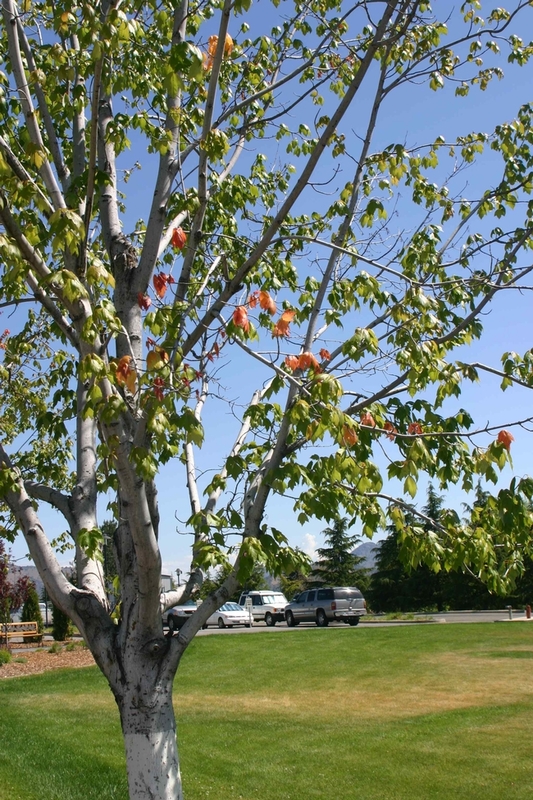 Saving mature trees during a drought should be a top priority in your landscape water use allocation. 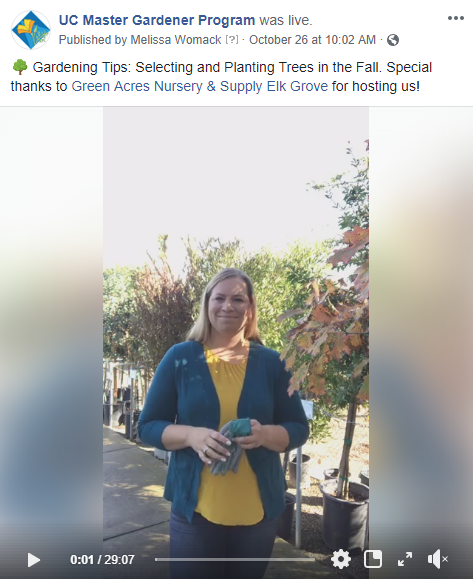 Understanding how to water a tree effectively is important to avoid water waste and to ensure that the tree is receiving the correct amount of water for its survival. One key factor to successfully watering a tree is understanding what soil type is present. Understanding soil types is an important factor in determining how much water is stored in the ground. For example, sandy soils dry out quickly while clay soils retain more water. Contact your local UC Master Gardener Program to learn how to determine your soil type. Another important factor is understanding tree anatomy for watering (see Figure 1). The tree roots of a mature tree are found in the top three feet of soil and extend outside of the tree's canopy. 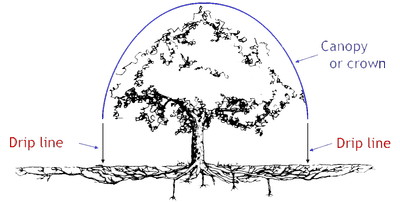 This outside area of the tree roots is the most active absorption area. Recently the Calif. Center for Urban Horticulture (CCUH) at UC Davis, UC Division of Agriculture and Natural Resources (ANR) and Ewing Irrigation devised a unique watering system called the Tree Ring Irrigation Contraption (TRIC). Using previous data from Netafim drip tube tables and from the Irrigation Association Landscape Irrigation Auditor manual, the partners envisioned a possible solution to mitigating drought conditions and the effect on landscape trees. The TRIC is an inexpensive kit that homeowners can put together for around $100 for one large tree. The TRIC could enable homeowners to adequately water trees to a depth of three feet with confidence, by using the recommended parts and using the TRIC calculator with accurate information. Aside from a recommended parts list, there is a “plug-in” calculator created by Dr. Loren Oki, UC ANR Associate Specialist in Cooperative Extension Landscape Horticulture for UC Davis & UC ANR. The TRIC calculator helps determine the run-time needed for the device.